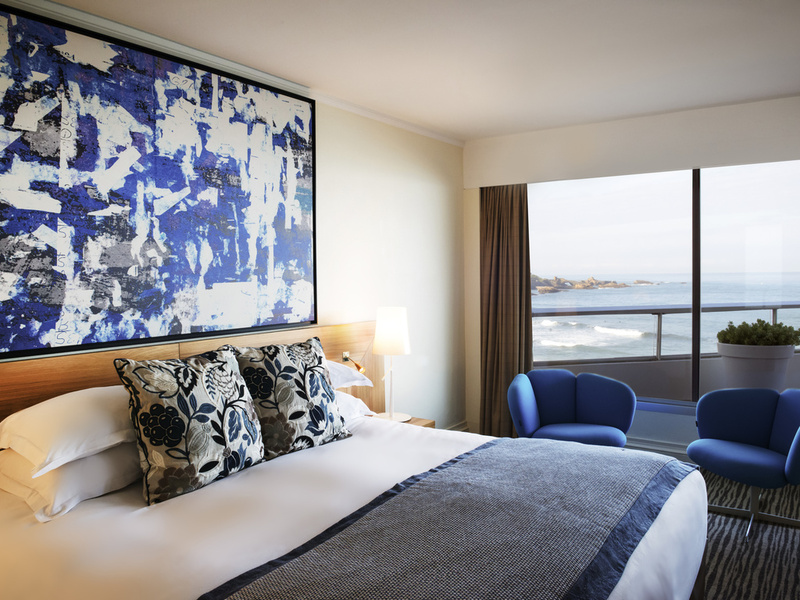 The 5-star luxury Hotel Sofitel Biarritz Le Miramar Thalassa sea & spa rests on the Basque coast, celebrating the relaxed art de vivre of southwest France. In this seawater spa hotel in Biarritz you feel as if you are on a cruise ship, gazing over the Bay of Biscay from vast windows, private terraces and a heated pool on the deck. A serene palette recalls the beach, bright with flowers and art. ISO 14001 certification confirms a commitment to nature. Please join us for a Magnifique voyage to a dazzling haven of well-being and relaxation on the sunlit Atlantic coast. Authentic Basque charm blends with French art de vivre and modern thalassotherapy. Life is Magnifique in Biarritz.. Benefit from innovative care programs performed by experts in seawater treatments. Each Sofitel is a unique blend of the French art de vivre and local refinement. Ideally situated on the Atlantic coast, Sofitel Biarritz Le Miramar Thalassa sea & spa combines the splendor of the ocean with the charm of Basque Country. From the moment you arrive, the chic floral decor of the hotel immerses you in a world of wellbeing and sophistication. The artwork on display in the lobby invites you to discover the talents of local artists. Later on, admire more works of art in the bright and cozy restaurant. Overlooking the pool and the ocean beyond, savor a meal that blends the delicacies of Basque cuisine with refined French gastronomy. To make a relaxing stay even more perfect, treat yourself to an appointment at the spa. Enjoy a body massage with pine oil, developed by KOS PARIS exclusively for Sofitel Biarritz Le Miramar Thalassa sea & spa. 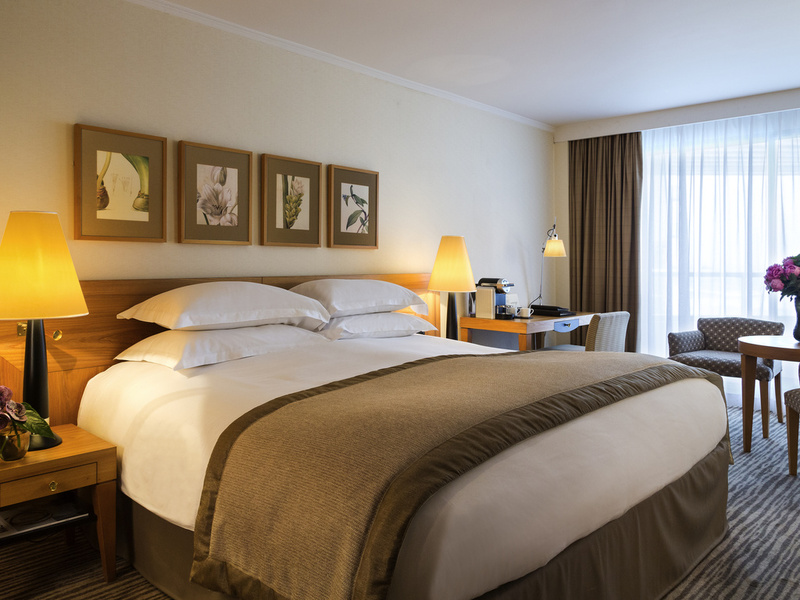 Our 126 peaceful rooms with comfortable "MyBed" beds look out over the magnificent beach and ocean. Treat yourself to a relaxing, unforgettable break. 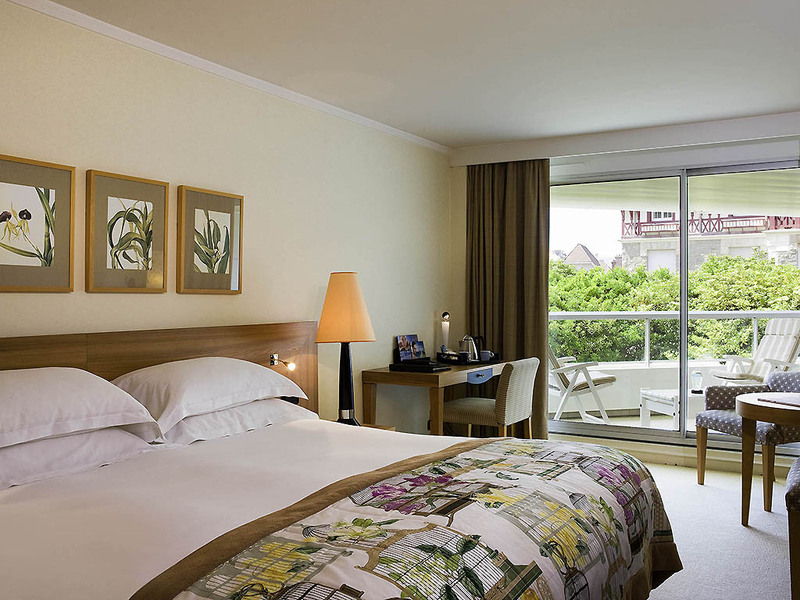 Our 17 spacious suites offer luxury accommodations on the Basque coast. Select one with a private terrace and linger, gazing at the endless expanse of ocean. 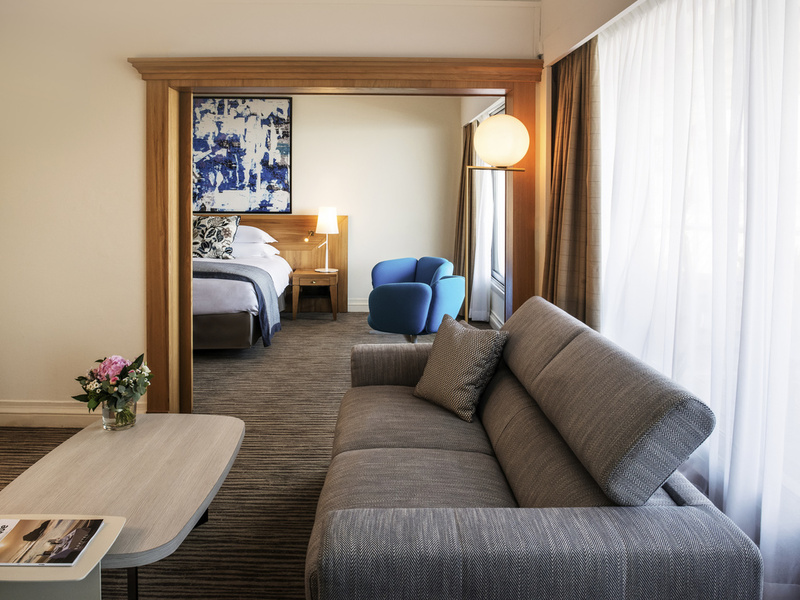 Each suite offers a haven of calm colors and luxurious MyBed along with Hermès amenities. 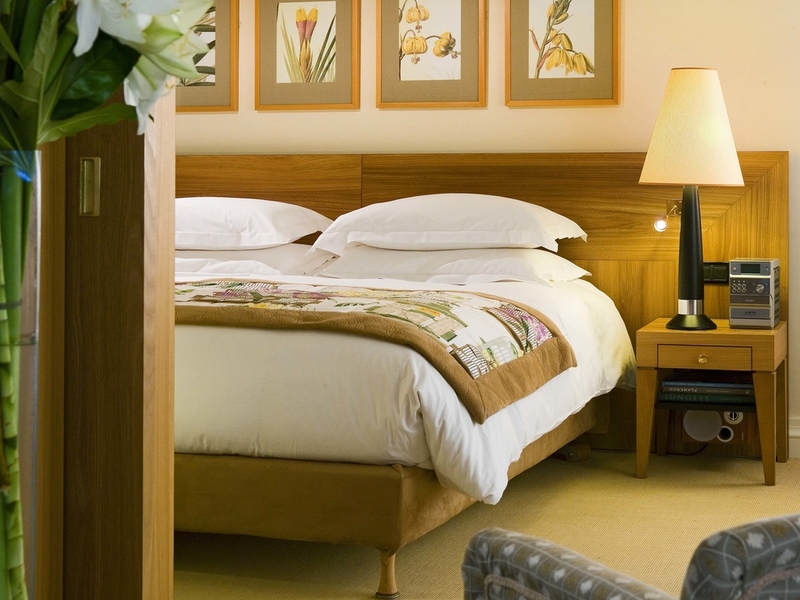 Superior Room with large bed or twin beds and terrace. Classic Room with 1 large bed or twin beds and terrace. 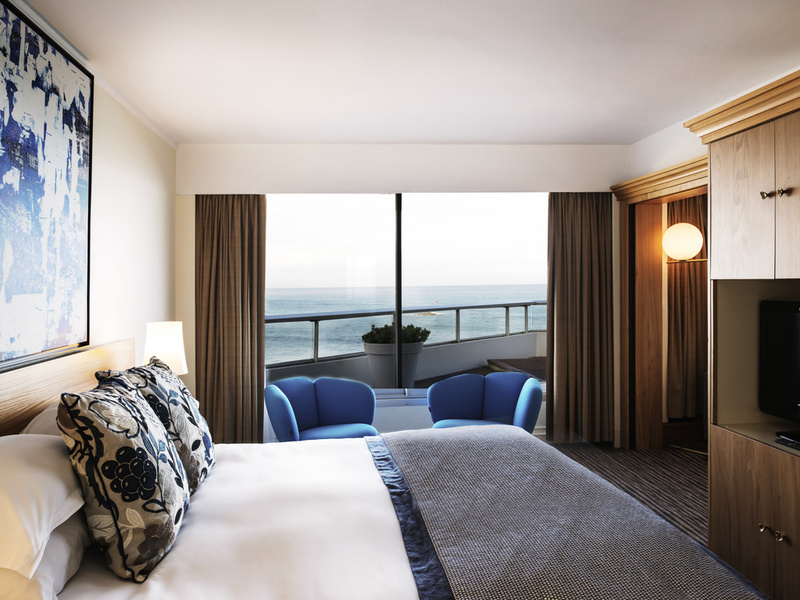 Superior Ocean Room with partial sea view, 1 king-size bed or twin beds. Luxury Room with beautiful sea view, king-size bed or twin beds, terrace. 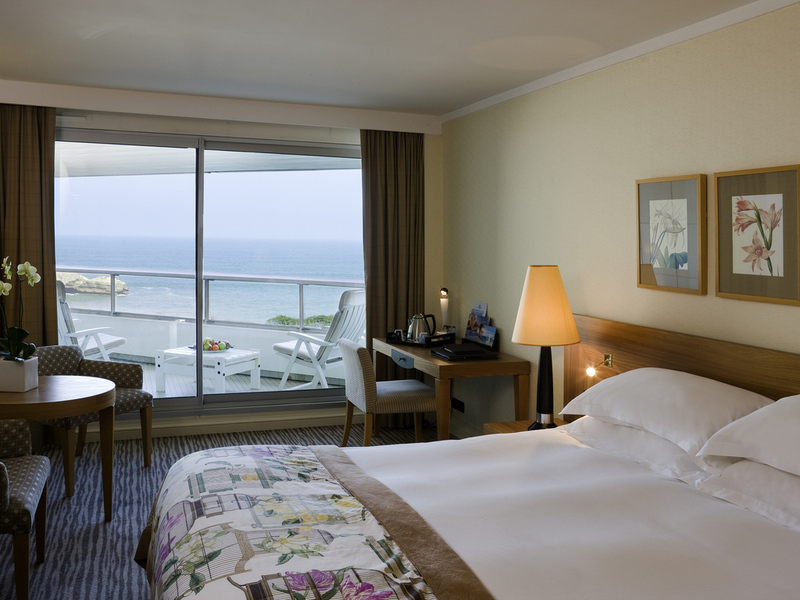 Junior Suite, sea view, 1 king-size bed or twin beds, large room and lounge area. To start the day in the peace and quietness of your room, select your breakfast option or choose from the a la carte menu. Our 24-hour room service menu satisfies every hunger. Be tempted by a full gourmet meal, or lighter fare with a De-Light meal. Baby bed /Crib is free. On request and upon availability. Explore delicious Basque cuisine at our unique Biarritz restaurants, serving relaxed, healthy lunches by the pool, and gourmet dinners in a cozy dining room. If you wish to control calories while enjoying balanced meals, select Light Well-being options. Mosey down to a cozy piano bar in this luxury hotel in Biarritz for a pre-dinner aperitif or after-dinner cocktail. The bar's contemporary Chesterfield-style salon invites you to sit back, drink in hand, and listen to the smooth sounds of jazz. Savor the fresh sea air and splendid panoramic views from the poolside terrace. Celebrate health and wellbeing at each meal with the De-Light menus created by our chef. Awaken your senses with an exquisite meal overlooking the pool and the famous Roche Percée. Relax in Côté Bar, sip a cocktail and watch the waves crashing against the Roche Percée in the Bay of Biscay. On Friday evenings, listen to the sweet sounds of Jazz filter through the air. Low calorie versions of cocktails are available. Summer days on the coast can be long and lazy, so the ideal place for a snack or beverage is the poolside B Côté Terrasse. Open only in the summer, you can enjoy drinks and snacks as you gaze at the ocean from the pool and breathe in the fresh sea air. An inspiring conference venue in Biarritz, this luxury hotel offers high-tech meeting facilities along with delegate packages that alternate business with thalassotherapy sessions and leisure activities. Hold a meeting for up to 20 guests in the Villa les Vagues executive boardroom, with ocean views, soundproof interiors and a touch-screen display for audiovisual equipment. Arrange a conference or cocktail reception for up to 250 in Arnaga and Ainhoa. InspiredMeetings planners help you with sur mesure meeting configurations and creative catering options. With a location just ten minutes from the airport and train station in Biarritz, you can be sure of a successful corporate event. For your honeymoon, the hotel warmly welcomes you in an intimate, relaxing setting. Share magical moments that leave lasting memories while soaking up the majestic beauty of the ocean. Give into a moment of well-being in our spa. Outdoor and indoor heated pools, private villas, solarium, sauna, whirlpool bath, beauty and hairdressing salon, and La Prairie, Decléor, Aquascience and Furterer products that are sure to entice you. Please join us for a Magnifique voyage to a dazzling haven of well-being and relaxation on the sunlit Atlantic coast. Authentic Basque charm blends with French art de vivre and modern thalassotherapy. Among the 5-star services of this luxury hotel are golf packages in Biarritz's prestigious courses, special couples' thalassotherapy treatments, Wi-Fi, car hire and parking. Arrange water sports and other activities in Biarritz with our concierge. Delight in a Magnifique stay in cosmopolitan Biarritz, and let our Golden Keys concierge arrange transportation, recommend local shops, book private tours, or make reservations at the finest restaurants in the city. Visit Biarritz and the Basque Coast in the luxury and comfort of a chauffeured limousine. Our Golden Key concierge will gladly organize this service at your request. The two saltwater pools are heated to 32°C indoors and 28°C outdoors. Outside, swim or relax with a cocktail while taking in the view of the ocean. Inside, stride through the pool against the current or soak in the jacuzzi. Recover at the fitness room with machines at the leading edge of technology. Celebrate your well-being while admiring the breathtaking view of the ocean and have a relaxing moment in our sauna.